BURLINGTON, Vt. - Saana Valkama registered two points (1 goal, 1 assist), but the 10th-ranked Boston College Eagles (15-9-0, 12-7-0 WHEA) were victorious against the Vermont Catamounts (7-13-4, 5-10-2 WHEA) Friday night at Gutterson Fieldhouse. "Credit to our team for a good battle tonight against a talented team," said head coach Jim Plumer. "We recovered from a poor start and played a very good second and third period. This team has no quit in them and I love how we battle to the end. We will be ready for tomorrow." - The Eagles went on the offensive early in the first period, but Melissa Black (29 saves) turned away several grade-A scoring chances. Black robbed Daryl Watts, last year's Division I scoring leader, from point-blank to keep the game scoreless. The UVM netminder then kicked away U.S. Olympian Megan Keller's shot from the low slot minutes later. - But Boston College was persistent and scored two goals in 1:35 to leave the first period up by two. Delaney Belinskas opened the scoring off a faceoff in the Catamounts' zone and Makenna Newkirk added her eighth of the season shortly after. - At 2:25 in the second period, Sammy Kolowrat registered her second goal of the season on the power play to cut the BC lead. The senior captain received a pass from Valkama and patiently wristed a shot from the top of the circle through traffic to fool Maddy McArthur (20 saves). Anna Erickson was credited with the secondary assist. - The momentum shifted for the Catamounts who went on to outshoot Boston College 12-6 in the middle frame and produce quality opportunities that nearly tied the game. 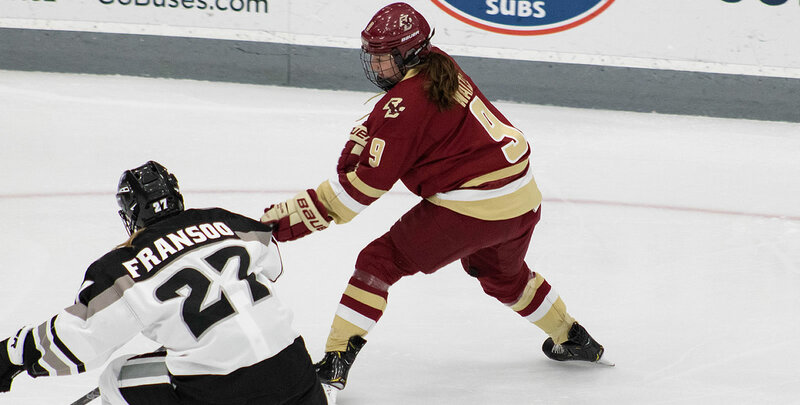 With 58 seconds left in the period, Erickson fired a shot wide of the net, but the puck kicked out to the left of the BC goal where Theresa Schafzahl was waiting. Schafzahl swatted at the puck, but the scoring attempt slid through the crease and wide of the net. - Boston College added two quick goals in the third period to increase the lead to three. Keller netted her 12th of the season with 17:10 left in regulation and Jillian Fey registered her first career goal nearly five minutes later. - The Catamounts pulled to within two when Saana Valkama batted the puck under the pads of McArthur for her sixth of the season. Taylor Flaherty and Kristina Shanahan assisted on the goal that came with 2:49 left. Black was pulled in the final minute, but Vermont was unable to even the game. With the impending winter storm, the game Saturday (Jan. 19) between the Catamounts and Boston College has been moved to 3 p.m. (originally 4 p.m.) at Gutterson Fieldhouse.